"Sign-cutting" is the ancient art of tracking, tracking animals - or men. The largest group still practicing this art in their profession is the United States Border Patrol - the best of them are called "signcutters". It is in recognition of their remarkable skill that this press is named. 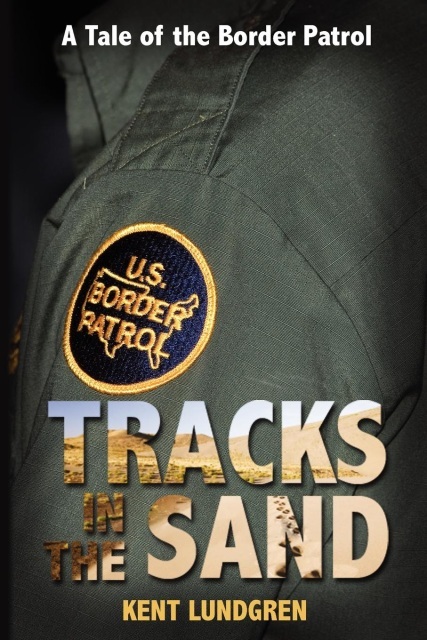 About the author of Tracks in the Sand. author of Tracks in the Sand. A 1925 Border Patrol hiring notice. A brief, official history of the Border Patrol. Author's Note The U.S.-Mexican border area is a strange place, not quite the United States and not quite Mexico. English and Spanish intermingle and a society exists containing elements from both sides of the border. Some would say the synthesis contains the best of both societies. Others would say it contains the worst. Both would be correct. But that is just the border area. "The border," however, is a line that divides two very different countries. The reader should understand that Mexicans and Americans have fundamentally different views of that border and what it signifies. Without going into historical detail, it is most easily said that Mexicans believe they were robbed of vast territory north of what has become the border. So, when a Mexican crosses the U.S. border illegally he has no sense that he is doing anything wrong; he believes he is simply overcoming an inconvenient impediment that does not belong there. The U.S. Border Patrol has existed since 1924 to correct that notion. They have not been notably successful in recent decades in doing so -- the presence of 20 million or more illegal aliens in the U.S. testifies to that sad fact. That is not the fault of the Border Patrol. It is largely because of ambiguous feelings on the part of Americans about whether the border matters or not. As a result, until about 2004, the Border Patrol was perennially resource-poor and undermanned by a factor of ten to what it needed. Historians say that the Mexican War ended in 1848. They are wrong -- the last shots have not yet been fired. In 2003, in the aftermath of the terrorist attacks of 9/11, the Border Patrol was placed within the Department of Homeland Security, where it became part of Customs and Border Protection. Before then it had been a part of the Department of Justice, and before even that, at the time of its founding, a part of the Department of Labor. Marcos Ayala is a Juarez businessman. His business is drugs and whores, and like any other entrepreneur, he has problems to deal with. One of them is the U.S. Border Patrol. To get his loads across the border he must constantly find ways to thwart their vigilance. Another is keeping his women in line, a never-ending nuisance, and he has a new girl who is more trouble than most. Luz Ortega was just a young country girl. But now she finds herself a captive, sold into a Juarez whorehouse and apparently doomed to the life. Even if she escapes she can never go home again. Is death the only way out? Or does Rafael Salinas offer hope? Rafael Salinas is a retired alien smuggler. He made his money, then, when drugs came onto the scene and the business turned violent, he retired. Now he has been forced back into the business-his granddaughter was kidnapped to compel his performance. He does it, but he vows vengeance. 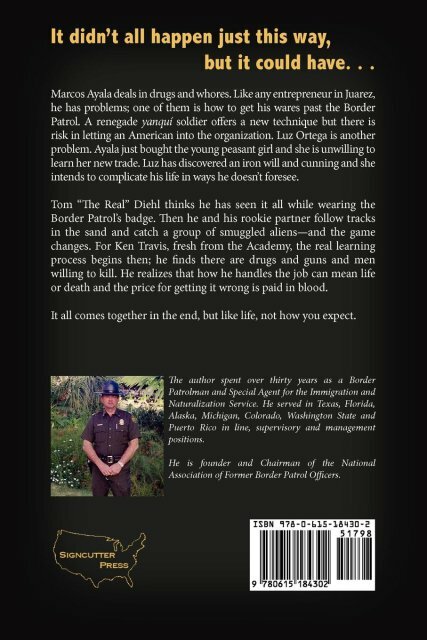 Tom "The Real" Diehl has been around the block a few times while wearing the Border Patrol's gold badge. He's seen it all in El Paso; there aren't many surprises left. Or so he thought, until he and his rookie partner follow tracks in the sand to catch a group of smuggled aliens. It seemed like any other trail until he thinks later about how they acted. Then it makes no sense. Something new is going on and they've got to figure out what it is. Ken Travis' biggest problem since he graduated from the Academy is getting Tom Diehl to talk to him. Then, suddenly, violence strikes and the real learning process begins. There are guns and drugs and very bad men out there, men willing to kill. How he handles the job can mean life or death, and he'd better get it right because the price for getting it wrong is paid in blood. I hope you'll enjoy the book as much as I liked writing it. It didn't all happen just this way, but it could have. As with most organizations, the Border Patrol's old timers (like your author) remember better days. In the Border Patrol it is the fabled "Old Patrol." In the Old Patrol things were harder. You didn't earn much, the supervisors were tougher, the bad guys meaner, you worked the whole day from "can see to can't see" and beyond, and you provided your own equipment. But on the other hand, men were taller and stronger and completely fearless. Everyone was a signcutter of note; some could even track a buzzard's shadow across a highway. They could run all day and not break a sweat, arrest ten aliens at once and never lose a one, and bad guys quivered in fear at the mere mention of their names. Naturally, they were all crack shots with anything that went "bang." It was a time when men were men and women were damn glad they were. It's nonsense, of course. Yes, there is an "Old Patrol." If you're a Border Patrolman it is made up of you and the officers who put the badge on before you did. Officers who came in after you are the new guys and the Patrol might not survive their presence. Or so goes the common wisdom. It is within that framework of belief that the following story takes place. "Well, Mr. Jones, you appear healthy enough. Do you own a gun, and can you shoot?" "Yessir, I do. There are bad men now in coffins who would testify that I can shoot - if they could." "That sounds like what we're looking for, Mr. Jones. Now do you own a sound horse and a good saddle? You'll be covering a lot of border on a horse." "Nobody's got a better horse than me. I rode him all the way here from Amarillo with hardly a stop. And tough? He'll run with a tornado just for the sheer pleasure in it." "You'll do, Jones. Go on out back, get your horse some oats and put him in the corral. We'll get with you when we're done." And the next candidate comes in. "So you want to be a Border Patrolman, eh, Mr. Smith? What makes you think you're qualified?" "Sir, I've ridden these canyons and draws most of my life. I know where the trails and water are and where men hide. If they're out there, I'll find 'em." "But do you own a pistol and a rifle Mr. Smith, and can you shoot? Some of these are dangerous men we're after." "Yes, I do, and yes, I can. If it comes to gunplay, I fear no man." "How about a horse and saddle? You must provide your own, you know." "Well, sir, I've had a piece of bad luck there. I was riding down here from Alamogordo just this morning and my horse stumbled in a hole and broke his leg. I had to shoot him, but I do have my saddle." "That is bad luck, Mr. Smith, and not your fault. We have a couple of spare horses and we can let you use one for a day or two until you buy yourself another. Now you go on out to the corral and wait until we're through in here." So Smith moseys on out to the corral, where he finds Mr. Jones sitting on the top rail, rolling a smoke. Smith throws his saddle on the rail, climbs up, and introduces himself. "New guy, huh?" says Jones. "Yup. Just got here from Alamogordo." "Don't have one right at the moment," replied Smith. "Hmmph," said Jones. "Back in the old Patrol we had to bring our own horses." The newly organized border patrol is looking for new men and an examination for positions will be held at Douglas and at centrally located places in the state some time after April 11. The patrol, which is a branch of the immigration service, will accept no man unless he is big and strong and fearless. He must have experience in cowboy work; tracking and general border occupations and he must have had service in some highly organized police unit or in some regular army. They must be between 23 and 45 years of age and must have had at least three years' experience in general ranch work along the border. This qualification is necessary because the principle work of these men is border riding, which is done mainly on horseback. Applicants must measure at least 5 feet 7 inches in height and be well proportional, they must be of good moral character, honest, and courageous. You can order Tracks in the Sand through your favorite local bookstore. Within the U.S. you can order a signed copy from the author with a letter and a money order to the publisher's address above. Price is $25.00 (That's publisher's price plus shipping via priority mail.) Please include in the letter how you would like the book inscribed. 328 pages, 6x9, perfect bound, black and white interior, publisher's price - $17.98. The author entered on duty with the Border Patrol in June of 1968. This tale is not autobiographical, but on the other hand, the author couldn't have written it if he hadn't been in El Paso in those days. The characters are fictional, but as is always the case in writing fiction, they are drawn from people whom the author has known. Anyone who was there in those days will recognize elements of the personalities of people they knew. After spending four years in El Paso, the author went on to serve in Miami, remote Alaska, Michigan, Colorado, Washington State, and Puerto Rico. Several of those jobs were not in the Border Patrol - but those that were not were with the old Immigration and Naturalization Service and involved enforcing the immigration laws of this country. He retired in 1997, but a year later he was brought back to serve for another four years. He left the job for good in 2002. 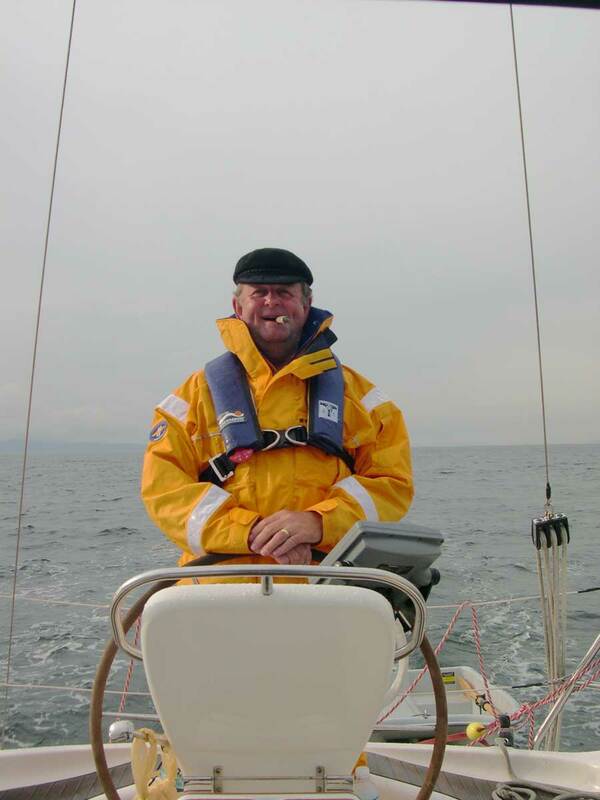 Since then he has spent his time riding and building Harley Davidson motorcycles, sailing, and writing Tracks in the Sand. He sits on the Board of Directors of the Center for Immigration Studies and is cofounder and past chairman of the National Association of Former Border Patrol Officers. The group is dedicated to educating the nation's leaders and citizens about immigration laws and enforcement, what has worked and what has not, and why, and why not. You may find out more about the group at the NAFBPO website.